What Now? It’s a question, that, over the past week, I haven’t been able to get out of my mind. I had the incredible fortune on Tuesday of attending the inauguration of our 44th President in Washington DC. Not only did I attend the inauguration, I had a ticket. Not only did I have a ticket, but I actually was able to make it, through security, to my seat. That’s right, not only did I have a ticket, but it was a ticket to a seat! Being amongst some two million people extending from the Capitol Building toward the Lincoln Memorial was an awe inspiring and humbling experience. Have you ever heard the stillness of two million people as they draw in a collective breath of expectant anticipation? It was both eerie in its quiet, and at the same time, sacred. Our text comes from the book of Jonah, the third chapter. But before we read it, I need to give you a bit of background. Odds are, no matter who you are, you’ve heard about Jonah before. You know, the guy who gets swallowed up by a large fish. Jonah, son of Amittai, literally meaning “son of faithfulness,” which, it seems, is a bit of a pun that the narrator shares with us, right at the beginning of the story, because Jonah is not exactly the most faithful of prophets. Everything is going fine with Jonah’s plan, he’s even napping through a mighty storm that the Lord sent upon the sea, a storm so intense that the sailors have begun to throw cargo overboard. The sailors cast lots and determine that Jonah is the cause of the storm. Jonah confirms that yes, this is true, he is the cause, for he is fleeing from the Lord. Terrified, they ask what needs to be done to quiet the sea. “Throw me overboard,” says Jonah, which they end up doing, reluctantly, only to have the sea calmed instantly. Now, instead of fearing the sea, the sailors feared the Lord, and were in awe. So Jonah set out and went to Nineveh, according to the word of the Lord. Now Nineveh was an exceedingly large city, a three days’ walk across. Jonah began to go into the city, going a day’s walk. And he cried out, “Forty days more, and Nineveh shall be overthrown!”And the people of Nineveh believed God; they proclaimed a fast, and everyone, great and small, put on sackcloth. When the news reached the king of Nineveh, he rose from his throne, removed his robe, covered himself with sackcloth, and sat in ashes. Then he had a proclamation made in Nineveh: “By the decree of the king and his nobles: No human being or animal, no herd or flock, shall taste anything. They shall not feed, nor shall they drink water. Human beings and animals shall be covered with sackcloth, and they shall cry mightily to God. All shall turn from their evil ways and from the violence that is in their hands. Who knows? God may relent and change his mind; he may turn from his fierce anger, so that we do not perish.” When God saw what they did, how they turned from their evil ways, God changed his mind about the calamity that he had said he would bring upon them; and he did not do it. The story of Jonah is one that has been the subject of much debate. Is it true? Did Jonah really exist, and if he did, did he really get swallowed up by a fish? Was it a whale? How in the world could someone live for three days in the belly of a fish? I don’t know. I don’t have an answer for you. But I do have a suggestion. The most shocking, unbelievable, and even scandalous part of this story has nothing to do with the fish. Jonah, the reluctant prophet, utters what is in Hebrew five words. He says them once. From those five words an entire city, one of the most powerful and most notoriously vicious in the Biblical record, Nineveh, repented. Nineveh, within the Assyrian Empire, believed the word that Jonah spoke. It was a five-word sermon and it inspired total conversion, not even the animals were left out. Everyone, great and small, fasted and put on sackcloth as a symbol of their repentance. Many have been quoting the fact that in spite of the massive crowd and the difficulties in moving amongst so many people, there was not a single inauguration related arrest. But the most shocking and unbelievable, and even scandalous part of this story has nothing to do with the law-abiding nature of the crowds. People gathered from near and far. They were from all walks of life, rich and poor, white, black, brown and everything in between, Democrats, Republicans and Independents. It was a coming together across those borders which normally keep us walled off from one another and isolated. People stopped to let others pass, said excuse me, and smiled. My friend Erica and I shared our honey-roasted peanuts with the man in front of us, who shared a bottle of water with us. We found out later that man was Bill Bradley, retired basketball player and US Senator who ran for president in 2000 and who happens to have also been a Sunday school teacher at Nassau Presbyterian Church in Princeton, New Jersey. There was a spirit of open friendliness amongst strangers, a spirit that seems to be so often absent in our world today. If only the book of Jonah ended with chapter 3. It really would make a great movie. Sweeping vistas of repentant Nineveh—120,000 people, plus animals, is no small number back in Jonah’s time. Even the king bowing down, in ashes, covered in sackcloth, humbled, and seeking to help the nation turn from its wicked ways. A humble king? It seems almost absurd, doesn’t it? Cue the epic song for the soundtrack, maybe something along the lines of Gone With the Wind, Lawrence of Arabia, or the Lord of the Rings… slowly fade to black and roll the credits…it’s a great ending. Except for the slightly inconvenient fact that the book of Jonah has a fourth chapter, a chapter that opens with the words, “But this all was very displeasing to Jonah, and he became furious, lost his temper, and yelled at God.” Why in the world would Jonah be angry? He was a success. In fact, he was much more successful than the big time prophets of old…Moses, for one. No other prophet in the history of the people of Israel had tried so little and yet accomplished so much as Jonah, son of faithfulness. Why in the world would Jonah be angry with God for being gracious? Why would Jonah stand against God being merciful? The text does not say it in so many words, but we can only assume that Jonah did not want Nineveh to be saved. Nineveh did not deserve to be saved. Nineveh, because of its wickedness, deserved to be punished. Nineveh deserved to pay for its evil ways. Nineveh did not deserve grace. And yet, there was Nineveh, repentant, listening to God, and obedient…better at listening to the word of God and more obedient, actually, than the prophet Jonah. The question is, what now? It is a question being asked of us as a nation, and of us as individuals. What now? The word repentance literally means a turning, to turn around. And we seem, at this particular point in time, to be in the midst of what can only be described as a sort of national turning, a turning toward service, a turning toward something larger than ourselves. Have you seen it? Have you noticed? • Starbucks is offering a free tall coffee to those who would pledge to donate 5 hours of service to their community. • Oprah Winfrey on a recent show, promoted a campaign called “I pledge” which asks all Americans to make a pledge for how they will, in the words of Gandhi, be the change that we wish to see in the world. • A glance at the covers that line the magazine racks conveys this sense of opportunity and responsibility being presented to us as a nation. The now President Barack Obama, in his campaign and since the election has repeatedly said that this turning must come from all of us, it is not something that can happen simply by coming from the top down. So, I think it is appropriate for us as individuals, for us as a nation, but also for us as the church, people who are striving to follow Jesus, to ask ourselves, what now? The Starbucks offer of a free cup of coffee for pledging 5 hours of community service ends today. Why not stop by after church and pledge your five hours? There are over 100 different opportunities available, just in the Placentia area. If you go to the Starbucks website you can see the list which includes everything from working with children, landscaping assistance, office support, or leading a Habitat for Humanity work crew. As of earlier this morning, over 1,240,640 hours had been pledged. This is just one way that our presbytery is seeking to discern, how can we best further the Kingdom of God, through service? Just a plug, if you’re interested in this you can come to Refresh and Renew on February 7th at Trinity Presbytery Church to hear more. For this message of service, of a calling beyond ourselves, to something more, this is not a new message for the church, is it? Isn’t this the message that we have been based upon? Isn’t this the message that we have been called to proclaim from the beginning? That we are all equal. That we are all loved by God and called by God. That we gain something in the giving of ourselves, rather than the storing up for ourselves. That God is gracious, merciful, slow to anger and abounding in steadfast love? That no matter who we are, whether a disobedient prophet, repentant evil doers, a nation in crisis, or someone who is cynical of what might seem to be an empty promise of change, conservative, liberal or apathetic, formerly enslaved or formerly the enslaver…that God’s grace is for us all, unmerited, undeserved, and unconditional. We don’t know how things turned out for Jonah. Or for Nineveh, for that matter. The story doesn’t tell us. Instead of the epic ending we were left with at the close of chapter 3, at the end of chapter 4, the end of the book of Jonah we are left with a sort of disjointed ambiguity. Will Jonah be angry forever? The text gives us no assurances. For me, it started back in December 2006 when I heard Senator Barack Obama speak at the Saddleback Church AIDS Forum. What impressed me on that day, and what has continued to both impress and inspire me about now President Obama, was his willingness to present what he believed, admit that it differed from the beliefs of many gathered at that event (specifically around issues of abortion) and yet acknowledge that there was a vast area of agreement upon which we could all work together. I was impressed by his candor, his forthrightness, and his ability to call upon something that went deeper than the typical left/right debate. Fast forward to January of last year. I was talking with a friend who mentioned that he was volunteering for the Barack Obama campaign. It was during that conversation that I realized it. If I care this much about this man becoming President, then maybe I ought to do something about it. Though it might seem like an obvious realization, the thought was a surprising one. Oh yeah, I guess you’re right. I do care. I ought to do something. Hmmm. Interesting. I’d never done anything like that before. I’d never cared before. Sure, there was the quarter in Washington DC program while I was in college. I worked for the White House. Yep, I was a White House intern. Before it was scandalous. It was the term of George HW Bush, at that time just called George Bush, as there was no need to distinguish him from anyone else. I had applied to work at the White House, not because of any ideological affinity, but because I figured it would be a cool place to work. In fact, on my application form, one of the questions asked for three policies of the president, and whether I agreed or disagreed with them. Truth be told, I knew about zero policies of the president, so I went to work scouring the newspaper (this was 1992, pre-Google) to find three policies and decide what I thought about them. I came up with two (which I cannot remember) but couldn’t seem to find a third. Then I remembered that the president did not like broccoli, and, for some reason, it had become quite a public dislike. So, broccoli it was. I disagreed. Seemed to me that the President of the United States publicly not eating his broccoli was a bad example for kids across the nation. “Eat your broccoli,” their moms would say. “Why do I have to? The President doesn’t” seemed like a pretty airtight defense. So I worked in the White House, as an intern, technically in the Old Executive Office Building. It was exciting. I loved it. But even still, it was not an ideological decision. It was just cool to be in someplace so historical and so central. Months went by. I was thrilled when Barack won the nomination. I hosted a “Convention Watch Party” in La Mision, Mexico, for friends there to gather in order to watch his acceptance speech. Most of us were in tears. We gathered together, those of us who had been working in the Las Vegas area, at the Rio Casino, on the Strip, to watch the election results. Just after 8PM, when the California returns were calculated, a roar went up from the ballroom as the realization sunk in. Barack Obama had just been elected President of the United States of America. Immediately hugs, high fives, cheering, and tears. People turned to each other, virtual strangers, but embracing a common humanity that somehow this campaign, this man, had brought out in us. It wasn’t his to give, it was ours, but in embodying it, he helped us uncover it in ourselves. Which is why, of course, I had to go to DC. I wasn’t going to. I thought I’d watch the inauguration in Mexico, with friends there, to celebrate together. But there was a tug. An opportunity presented itself. So, on January 20, 2009 I found myself standing, well actually sitting, on the west side of the US Capitol building, a witness to history, celebrating, cheering, and once again hugging, high fiving, and embracing the strangers surrounding me as we honored our common humanity. 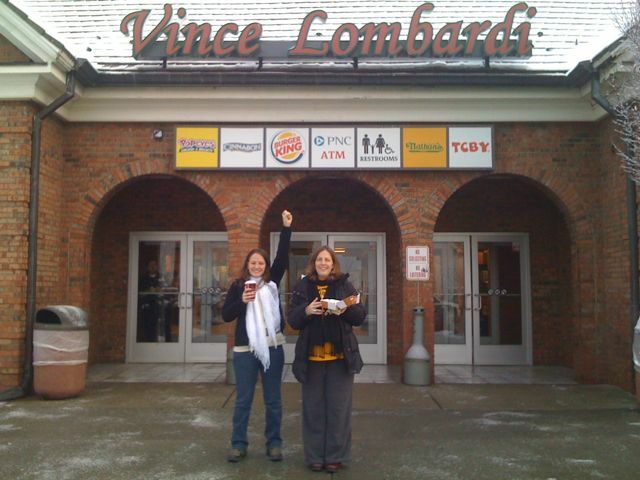 At 8AM we arrived in New Jersey, state 3 (Connecticut and New York were the first two) of our journey and first bathroom break of the trip at the Vince Lombardi Service Area. It snowed last night, a heavy sticky snow, so the drive through Connecticut and into New York, along the Merritt Parkway, was beautiful. We’re now on the New Jersey Turnpike thru Newark, which is not exactly the ‘garden state’ part of the Garden State. Abby is re-caffeinated, Erica and Maya are napping and I’m enjoying New Jersey. The journey begins…Abby, Erica, Maya (Erica is 8 months pregnant with Maya Lynn), and I got up early this morning to begin our journey from Hartford, Connecticut to Washington DC for the inauguration. First stop, 5:30AM, Dunkin Donuts for coffee. A few thoughts from the early morning. “This is so much nicer than a bus.” Abby, who was initially going on Greyhound. “I’m so excited that my daughter will grow up in a world where this has always been possible.” Erica, due in early March. “First California and Texas volunteering in the primaries, then Vegas for the election and now DC. I’m thrilled to be going.” Erin, who is really excited to be posting this via iPhone from the car. I’m so excited to report that I will be attending the inauguration of Barack Obama!